Welcome to the 2017 United Way Community Campaign! Yesterday, more than 300 community members gathered at the Milwaukee County Zoo to kick off the annual United Way Community Campaign. 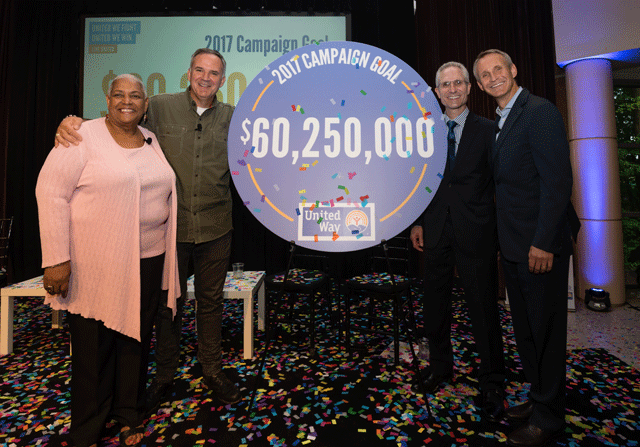 Campaign co-chairs Sheila Cochran, Milwaukee Area Labor Council AFL-CIO Retiree; Matt Levatich, Harley-Davidson Motor Company; Jay Magulski, Landmark Credit Union; and Jonas Prising, ManpowerGroup, premiered the 2017 Success Story videos, shared exciting new United Way initiatives and developments, and unveiled the 2017 Community Campaign Goal: $60,250,000. Now it’s time to get to work. United, we fight for those who need a voice, and for those whose names we do not know. No matter the obstacles, no matter the odds, we surround the community’s most critical problems…and we fight. To live better, we must Live United. How will you be part of the story? Did you attend the event? Check out our Facebook photo album and tag yourself! Get those tissues ready! Watch the 2017 United Way success story videos and share with your friends and family. Or read and share the 2017 stories here. Never miss an opportunity to impact your community. Connect with us on Facebook, Twitter, LinkedIn, and Instagram. Use #LiveUnited. Subscribe to United Way’s Living Local podcast to learn about United Way initiatives, non-profit and corporate partners, and the issues affecting our local community. Read more about the work of United Way of Greater Milwaukee & Waukesha County. Your gift to United Way's Community Fund, strategic focus areas, or community-wide initiatives ensures that your donation is invested where the need is greatest. Donate today. Create a workplace team to get out in the community or coordinate an on-site activity and volunteer together! Gain insights from technology entrepreneurs on how to accelerate the growth of our local startup ecosystem. Join Retire United to hear from local experts on preparing for unexpected costs. The Milwaukee LIHF Collaborative is dedicated to improving community conditions that support healthy birth outcomes. All are welcome to this meeting to learn more and get involved in the work of Milwaukee LIHF. Join LINC at Vision Forward Association to work on outdoor beautification projects. Lunch, beverages, lawn games, and a tour to follow! Male volunteers are needed for this free, one-day life and job seminar for local men looking to develop professional skills, find a job, or explore a new career. Save the date to volunteer for this free seminar for women looking to reenter the workforce, explore a new career, and build confidence. Check out designer Linda Marcus talking about the event on TMJ4’s The Morning Blend. Enjoy a one-of-a-kind luxury shopping experience with a collection of local, women-owned retailers. Proceeds will benefit United Way’s Community Fund. *Save $30 when you buy tickets to both events. Learn more. Volunteer for a one-day, one-stop-shop event that brings resources and services to serve people experiencing homelessness.